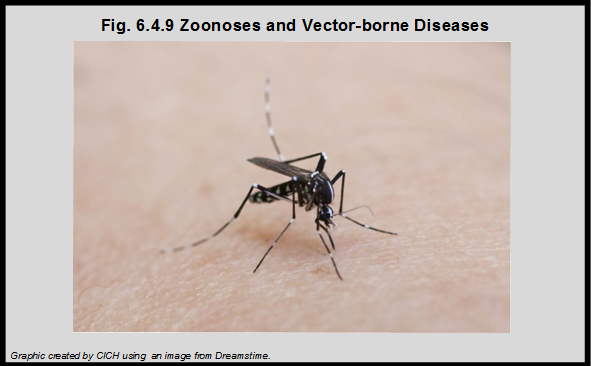 The threat of contracting disease through zoonoses (disease directly transmitted from animals to humans) and vector-borne disease (those transmitted between humans or from animals to humans by an arthropod such as an insect) may be increased with climate change. In Canada, Lyme disease, spread through ticks, is considered an important threat. The annual number of cases of Lyme disease in Canada has increased from roughly 30 cases in 2007 to 315 in 2012.2 The southernmost areas in Canada are the most vulnerable to Lyme disease as ticks live in warm areas. 1Ebi, K.L., & Paulson, J.A. (2007). Climate Change and Children. Pediatric Clinics of North America, 54, 213-226. Canada, Ottawa, ON, p. 191-232. https://www.nrcan.gc.ca/sites/www.nrcan.gc.ca/files/earthsciences/pdf/assess/2014/pdf/Chapter7-Human-Health_Eng.pdf-accessed July 25, 2017. 3Berrang-Ford, L., MacLean, D., Gyorkos, T., Ford, J., and Ogden, N. H. (2009): Climate change and malaria in Canada: a systems approach; Interdisciplinary Journal of Infectious Diseases, 2009, 13 p. as cited in Berry et al., 2014 (above).